I admit it! I believe in handing out nutritious treats for Halloween. I would hand out toothbrushes and toothpaste if my children were not mortified at the thought! That is why I LOVE finding new "candy" products that are good AND good for you! Yummy Earth is a company I have been purchasing for some time. My family loves their lollipops, and I love giving my children a candy that is organic. They taste delicious, and are the best lollipops/ suckers I have ever had! I am sure you can imagine how thrilled I was to review another great product, just in time for Halloween. 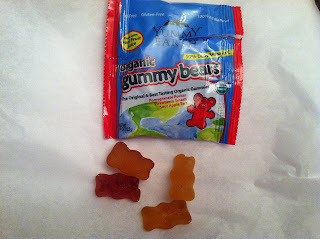 MamaBreak was given the opportunity to review their Gummy Bears, and I believe this is the perfect treat to hand out for Halloween! The packaging is perfect for the ghouls and goblins that stop by your home. They are not only organic, but the are made from fruit juice! The are fat free, nut free, no artificial flavors, and no artificial colors. The best part . . . they taste AMAZING! My kids loved them! So be prepared when the trick or treaters stop by your door with Yummy Earth-- making Halloween nutritious, delicious, and fun! I haven't tried the gummy candy but I love the suckers. I will have to try to find these and try them! If they are really good I would probably keep them for myself...lol. What a neat idea for Halloween. I haven't seen these before however they look great. Perfect for school snacks too. Thank you. I love gummi bears have never tried this organic bears...look yummy! 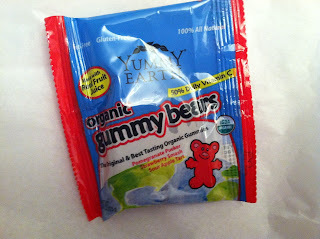 My grand kids love them darn gummy bears..lol I have never tried organic though! I love Gummi Bears and would love to try these! I keep hearing a lot about Yum Earth and would love to try their candy! I LOVE Yum Earth products. It didn't even occur to me to get their candy for Halloween! I still have yet to try Yum Earth but sounds like good candy for the kids, maybe even my candyholic fiance'.